The 2nd International Uranium Film Festival of Rio de Janeiro 2012 awarded the best films of the festival. Three films from USA, Sweden and Germany were honoured with the festival’s "Yellow Oscar". Bill Keisling's "Not for Public Release: a Nuclear Incident in Lock Haven", USA, received the Best Feature Award, and Swedish Filmmaker Marko Kattilakoski received the Short film Award for his movie Coffee Break (Fikapaus). "Leonids Story" by German film director Rainer Ludwigs and Ukrainian producer Tetyana Chernyavska got the Yellow Oscar in the animated film category. Watch here the video statements by Bill Keisling and Marko Kattilakoski. A special recognition was made for Peter Greenaway’s extraordinary shortfilm "Atomic Bombs on the Planet Earth". That outstanding experimental documentary, that shows the insanity of over 2200 atomic bombs dropped on the planet Earth between 1945 and 1989 was honoured with the special recognition “Hors Concours”. “Peter Greenaway, a multi-artist with more that 70 films produced, is in a category in his own”, said Uranium Film Festival Judge João Luiz Leocádio, nuclear engineer and professor for cinema at Niteroi’s Univercity UFF (Universidade Federal Fluminense). The Festival screened more than 50 films. in Berlin together with the Brazilian film directors Laura Pires and Luiz Eduardo Jorge. 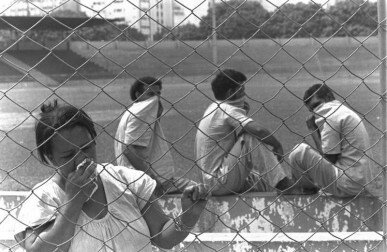 Maõs de Césio / Hands of Caesium", is a photo exhibition about the nuclear accident that happend September 1987 in the City of Goiânia with the radioactive element Caesium-137. 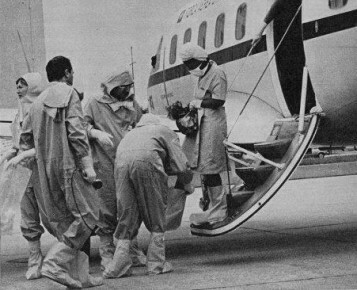 It was the worst radioactive accident of Latin America. 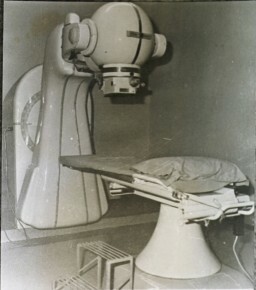 Two scrap metal dealers found an old radiotherapy unit in an abandoned cancer hospital. They did not know that this machine was radioactive and contained highly dangerous Caesium-137, so they broke it into pieces and the deadly accident happened. 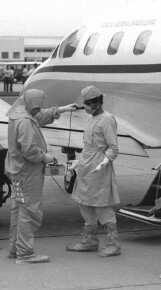 Thousands of people got contaminated. About 80 people died until today from the radioactive contamination, according to the association of the caesium-137 victims. Until today, many of the surviving victims are not compensated by the state and are in need of help. 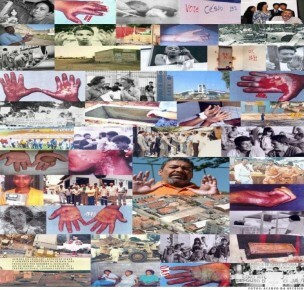 After Goiânia similar accidents happend in other countries: 2000 in Malaysia and 2010 in India. The Yellow Archives created this exhibition 2011. And we showed it May 2011 in Rio de Janeiro and later in diffrent cities of Northeast Brazil. In June 2012 we present the exhibition during the "alternative" Rio+20-Events. 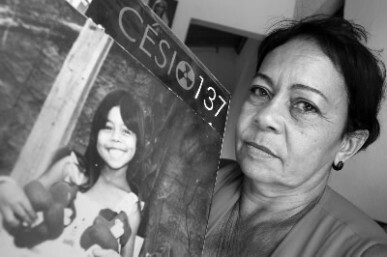 We thank the Association of the Ceasium-Victims AVCésio, the documentary centre of the Journal JB (Jornal Brasil CPdoc JB) and the Foundation Roberto Pires for supporting the exhibition by providing photos and information. At the moment, the exhibition is available in Portuguese, but we plan to translate it into English, so that it can be shown in other countries. We appreciate your support and donation! 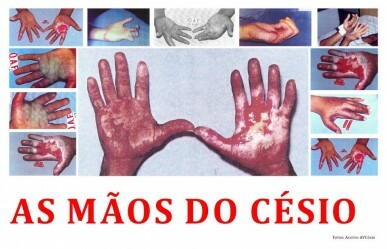 One of the first victims of the radioactive accident of Goiânia with Cesium-137 September 1987 was a 6 year old child. Leide das Neves had no time to play. Inspired by a dream of nuclear waste as a malignant tumour in the earths skin a woman journalist sets off on a road trip. She follows the route taken by the trucks carrying nuclear waste from the nuclear power plant in Cape Town to their destination in the pristine semi-desert region of Namaqualand. There she meets men and women of the Nama-Khoi tribe, who live in the area, and listens to their untold stories. Over 8 years, her investigation leads her to the homes of other communities living and working in close proximity to nuclear facilities - from nuclear fuel manufacturing plants to nuclear waste dumps and future nuclear power plant sites. Buried in Earthskin subtly demonstrates how energy and political power go hand in hand, and gives a voice to marginalized indigenous peoples who have paid the ultimate price for decisions made (about where we get our electric power) for the sake of political and financial power. From 1951 to 2005 at least 13,000 tonnes of uranium have been proposed on German fields. Phosphate fertilizers were dirtied with an average of half a pound of uranium per tonne. The confederation of industries agrarian and the farm association do not take a serious view on that. The natural uranium deposits in our grounds are much higher, than the additional load by the fertilization. Besides, they hide that the so-called "natural uranium" is already integrated since millenniums firmly in the crystalline structures of the rock, the uranium from the fertilizer, however, is very slightly water-disolvable and movable and can reach very fast in the drinking water leaders. In an exciting trace search author Dethlev Cordts is looking for the springs of the uranium coming along in the drinking water. Uranium mining was imposed on the Traditional Owners of Kakadu, Australia in the late 1970s and the controversial Ranger mine commenced production in 1981. Three decades later Kakadu uranium is still shipped out of Darwin to fuel nuclear reactors in Japan, Europe and elsewhere. The film includes rare footage of Mirarr Senior Traditional Owner Toby Gangale stating clear opposition to mining on his country and documents his prescient concerns about uranium. It shows how the Federal Government overrode the human rights of Kakadu's Traditional Owners in order to impose a toxic industry in a World Heritage Area. The film provides a unique insight into a story that continues to generate heartache and headlines today. During a coffee break two men, wearing protective suits, are having a conversation about Chernobyl, Harrisburg, Forsmark and nuclear meltdowns. Back at work their lack of empathy makes them true professionals. And someone else becomes a victim. Coffee Break is a comedy-thriller. The film addresses the isue of radiation in food after the March 11, 2011, Fukushima desaster. The film features interviews with food producers, restaurant owners and new parents about the food consumption has changed after the nuclear accident and the contamination of the food chain with radioactive elements. A documentary film featuring footage captured immediately after the blast, it calls for the abolition of nuclear weapons and world peace from the viewpoint of a mother in Hiroshima. Jabiluka tells the story of the Mirarr Aboriginal people's opposition to another uranium mine on their country in World Heritage listed Kakadu National Park. It was pivotal in mobilising public opposition to the mine. The mine was halted. 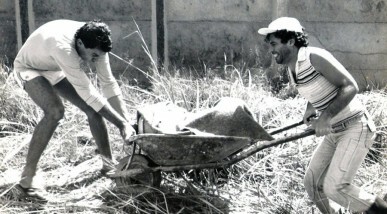 Production: Roberto Pires e Oscar Santana. In the future ... Due to radioactive pollution of the environment, mankind tries to survive in the underground corridors of a bunker. 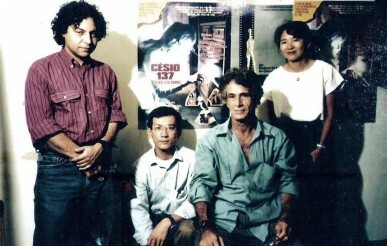 Produced in 1979, the film is a fiction, a result of the filmmaker's interest with the nuclear issue, and his encounters with the scientist Cesar Lattes. 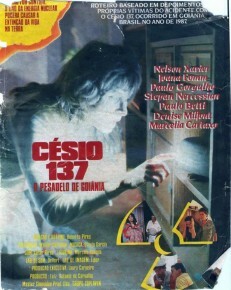 In the cast: Norma Begell, Brazil´s Julia Roberts at that time. 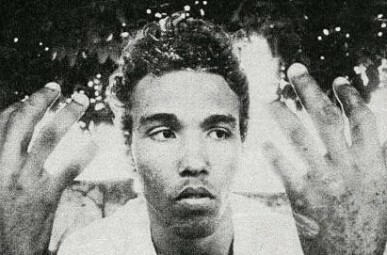 In Pocinhos (Paraíba, Brazil), approximately fifty years ago, some unidentified US citizens began to appear frequently, leading a scientific research in anonymity. 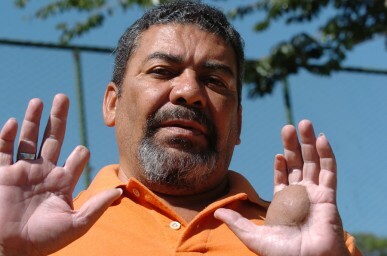 The small semi-arid city of Paraiba, today, has a high rate of cancer. 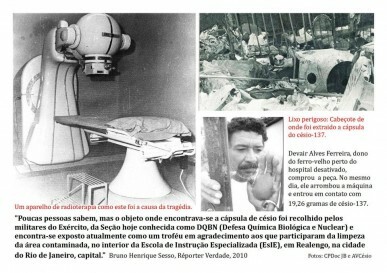 Brazilian scholars, in the 70's and 80's, made scientific investigations in loco, confirming the presence of Uranium in Pocinho's subsoil. In this documentary, the inhabitants talk about the situation, as some of them witnessed the Uranium extraction process and its measurement with a scientific equipment. They express their opinions or even take a chance to protest against the silence that still deny, to local population, any information that could eventually clarify the facts and, above all, the relation between Uranium and cancer. 25 years after the biggest nuclear accident in history, wolves reign the radio-actively contaminated no-man's-land, the so-called exclusion zone, of Chernobyl, which stretches from Ukraine into Belarus and Russia. After the explosion of the Chernobyl reactor on April 26, 1986, one city and some 150 villages were evacuated. 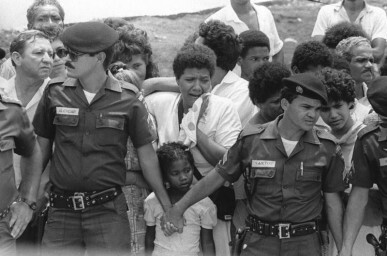 About 340.000 people were displaced. Uninhibited by the presence of humans, a profusion of wild species has since taken over a territory of about 3.000 square kilometers, creating a new wilderness. At the top of this eco-system is the wolf. Rumors about wolves in the zone have been numerous, but hard facts are still rare. Curious about these rumors, Christoph and Barbara Promberger, carnivore experts from Germany and Austria who have conducted wolf studies around the world visited the zone in 2009 to get a personal impression. They were overwhelmed by the obviously numerous presence of wolves in what has been called the Chernobyl Jungle and is officially the Polessie Radio-Active Reserve. Fukushima anti-nuclear demonstrations during May and June 2011. We have filmed at demonstrations and talked with the activists who organized them. We also talked with intellectuals, social and political scientists, about the magnitude of the current protests. During these months, we met a lot of inspiring people and got heaps of interesting footage of this new-forming movement, which seems to combine so many groups and organizations and may cause a major shift within Japanese politics and society. With RADIOACTIVISTS, we captured the spirit of this momentum, showing the challenges and triumphs of a movement of great historical significance. The film sets in Rokkashomura in the northern part of Japan, where they have built a nuclear reprocessing fuel plant in 2004. This fuel reprocessing plant is for recycling nuclear power by removing plutonium from used nuclear power fuel. This film shows the various lives of the people that live in Rokkashomura and how they are living with the new nuclear reprocessing plant. A lady in the village pursues her activism in order to stop the reprocessing plant. She grows tulips to help raise awareness of what Rokkashomura still has to offer. She even held a farmers market and told each customer "these maybe the last organic plants you can buy without any radiation". This fuel reprocessing plant has divided Rokkashomura into people for and against the building and usage of the plant. Film documents from the past five decades prove that the use of nuclear energy – whether for peaceful or for military purposes – was made socially acceptable only by repeatedly duping the population. "The Eighth Commandment" (thou shalt not bear false witness on thy neighbour) shows disturbing pictures of nuclear reprocessing plants, giving a sobering insight into the history of atomic power: from Otto Hahn to VEBA chief Benningsen-Voerder. From the first tests in the Nevada desert to the catastrophes of Three Mile Island in the United States to Chernobyl in the former USSR. From political speeches to the civil-war-like scenes at the nuclear power plants of Whyl, Wilster, Brokdorf and Wackersdorf. A TV report about Urgeiriça, the last uranium mine in Portugal. It shows the health porblems of the population of Urgeiriça and the whole area of the town Viseu in the neigbourhood. Many people are ill and hundreds died of cancer. Shortly after nuclear weapons were first invented, Albert Einstein stated: "The unleashed power of the atom has changed everything save our modes of thinking and we thus drift toward unparalleled catastrophe. The Red Button is a 52-minute documentary film that tells the dramatic story of Stanislav Petrov, the Russian officer who, in 1983, saved the world from atomic war. During the early '80s, the Russian leader was Jurij Andropov, the most right-wing Soviet leader since Stalin. A known hardliner, Andropov was very wary of US activity. It was an intense period of time in the relationship between the United States and Russia. Tensions were running high between the two superpowers, and the atmosphere was suspicious because of recent incidents. On September 5th, a Korean jet liner with 269 passengers, many of whom were American, had been shot down over Soviet territory because the Russians believed it was a spy mission. The action led Reagan to label Russia an "evil empire." Soon after, the KGB communicated to the western operatives to prepare for possible nuclear war. It is now thought that throughout 1983, the Kremlin assumed that the US and its allies were planning a nuclear strike on the Soviet Union. So it was in this tense environment that Stanislav Petrov worked deep inside Serpukhov-15, a secret bunker, monitoring early warning satellites. On September 26, 1983, Pietrow was in charge of monitoring American missiles that could potentially be sent to Russia to start a nuclear war. It was not his normal duty; he was to man the post twice a month just to keep his skills from getting rusty. Shortly after midnight, Petrov noticed a missile on his screen. Thinking it was a possible error, he nervously ignored it and waited for any other indications of war. Several minutes later, things became much more serious: four more missiles appeared and a flashing red warning sign began asking him to confirm an incoming attack. By pressing the red button, Petrov would have sent the information up the chain of command to Jurij Votincev, the Commander in Chief of the Russian missile defense, and then to Jurij Andropov who was in charge of the new "nuclear suitcase" and who would have undoubtedly called for a counterattack. Petrov knew he only had about fifteen minutes to decide what he would do before the missiles would reach the Soviet Union. If he didn't pass the information along, Petrov would be ignoring orders and taking responsibility into his own hands. The protocol, which Petrov had written himself, clearly indicated that the correct course of action would be to inform the Commander in Chief. 120 panicked military officers and engineers sat behind him, looking at the screen and waiting for his decision. "Everyone jumped from their seats looking at me," says Petrov. "What could I do? 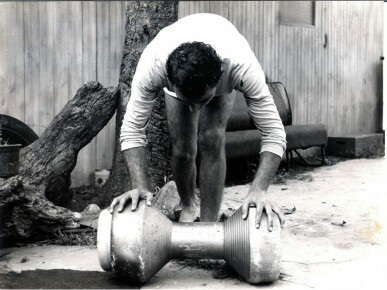 There was a procedure that I had written myself." The future of the world was in the 44-year-old Russian officer's hands as he wrestled with the decision of whether or not to use Russia's atomic button. In a bold move, however, Petrov decided against it, blaming the signals on faulty equipment instead of imperialistic aggression. At the time, he was not sure he had made the right choice. Fortunately for all of us, Petrov made the correct decision. His reasoning was that if the Americans were going to start an atomic war, they would have sent hundreds of missiles, not just five. The Secret and the Sacred. Two Worlds at Los Alamos. Hidden in the mountains of Northern New Mexico lies the birthplace of the Atomic Age: Los Alamos, home of the "Manhattan Project". Here Robert J. Oppenheimer and his staff created the first atomic bomb, "Trinity", the scientific prototype to "Little Boy" and "Fat Man," the bombs which hastened the end of World War II by leveling Hiroshima and Nagasaki. Although the laboratory is today also a leading center of genetic research, it remains a place of secrecy, for its main mission is to maintain the existing nuclear arsenal - a task that hides behind the name, "Stockpile Stewardship". The secret meets the sacred upon the mesa of Los Alamos. The lab takes up forty-three square miles - indigenous land of the Tewa people from the pueblos Santa Clara and San Ildefonso. The local Indians are cut off from their traditional shrines of worship: their prayer sites are either fenced off or contaminated. One of the sacred places contains the petroglyph of Avanyu, the mythic serpent that is the guardian of the springs. The Avanyu petroglyph was created long before the first White man set foot on the continent. According to tribal wisdom, those who poison the water must face Avanyu's fiery revenge. The local ground water has been contaminated by decades of the laboratory's uncaring. Warnings from the pueblos' spiritual leaders to laboratory officials fell upon deaf ears. At the laboratory, formulas pull rank on myths. Most people think that in Brazil there are indigenous peoples only in the Amazon. But in fact there are indigenous people like the Guarani Mbyá of Rio de Janeiro all over Brazil. This film presents the strong 94 year old chief of the Guarani Mbyá and his strong prophetic speech about nuclear energy, ecology and future. The Brazilian Government has build two nuclear power plants (Angra 1 and 2) on the traditional land of the Guarany Mbya and is now constructing the third plant, Angra 3, at the same place. The indigenous name of that place is Itaorna, which means wrotten rock. In the investigative report, an American veteran who participated in "Desert Storm" accuses the Us Administration of having used a small nuclear penetration bomb with an energy of 5 kilotons between the Iraqi town of Basra and the border with Iran. Consulting the "Seismological International Center on line data archive" we found that in the area indicated by the veteran, a seismic event with a power of 5 kilotons was registered the last day of the conflict. "To Whom It May Concern" is a record of broken people's lives in Belarus five years after the Chernobyl power plant explosion. It shows the plight of children and their parents who have been eating low level radiation food. It is an attempt to warn the rest of humanity to the danger of being exposed not only to radiation but to the undisclosed truth. The film was produced 5 years after the Chernobyl nuclear explosion happened. Becoming sick as a result of exposure to the low dose radation for 5 years, and fearing for the health of her then 7 year old son, director/ producer Galina Sanderson decided to attract international attention to the situation in Belarus. The State run media was not allowed (and still is not) to reveal any factual health related information or sócio-psychological effects of the accident, and the director/producer had to quit her position in Belorussian State TV in order to make this film. Located on the ancestral lands of the Santhal, Munda and Ho Peoples in Jharkhand, India, Jadugoda is home to almost all of India's Uranium reserves. Moushumi Basu reports on a shocking story that the Uranium Corporation of India Limited (UCIL) and the Government of India doesn't want you to know about. Toxic Neglect was produced for Women Aloud Videoblogging for Empowerment (WAVE). The short documentary about Jadugoda is a candid story narrated by the villagers themselves before the camera. Eight thousand people once lived in and around Uranium City, Sask., in the northwest corner of the province. Founded as a tent outpost in the early 1950s when uranium was discovered nearby, it grew into a thriving community with dozens of mining ventures as well as hotels, apartment blocks, a movie theatre, a hospital and CANDU High School. In the mid-1960s, however, the United States government stopped purchasing Canadian uranium, and the bottom began to fall out of both the market and the city. When the last mine closed in 1982, the exodus began. Portugal has 100 Year long history of Uranium Mining. Also Uranium of Portugal was used to make the first nuclear bombs. Now Portugal´s last big uranium deposite is situated close to Nisa, a beautiful village in the north of Alentejo. In an act of prevention, citizens demonstrated against any uranium mining development. They decided to prefer a sustainable production of local products like chease and olive oil than jobs in the uranium industry.